Prince William was visiting the UK Innovation Hub at the International Business Festival in Liverpool when he was introduced to a team of engineers from the University’s School of Mechanical, Aerospace and Civic Engineering. 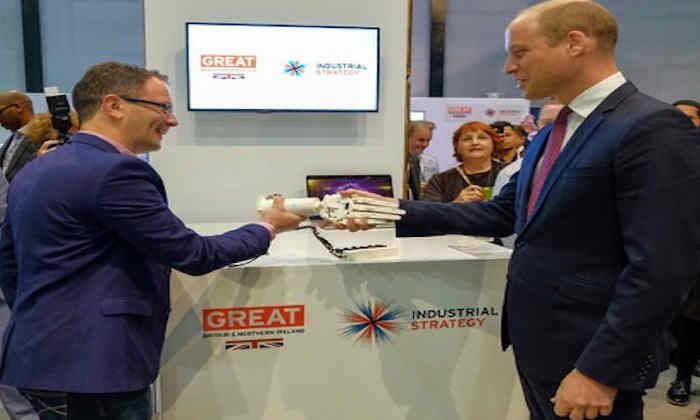 Dr Carl Diver and PhD student Tom Kendall were demonstrating a prototype 3D printed robotic hand when the Duke of Cambridge made an official visit to the pavilion celebrating the best in UK innovation. After shaking hands with the device, Prince William asked Carl and Tom about how it was made and its potential applications. “The Prince was clearly very impressed with the innovation and enterprise of Manchester students who have developed this robotic hand. He was keen to understand about how it worked and the mix of technologies we have put into this exciting prototype,” explained Dr Diver. The robotic hand is one of a series of devices which have been developed by Manchester masters students at low cost using 3D printed technology - but still have impressive anthropomorphic properties. An ideal application for these highly dexterous devices is affordable robotic prosthetics. Currently an advanced robotic prosthetic limb can start at approximately £25,000, going up to £60,000 if bought privately. The Manchester prototype 3D printed hand was made for a few hundred pounds.